The Memphis Commercial Appeal died as a genuine newspaper on July 12. 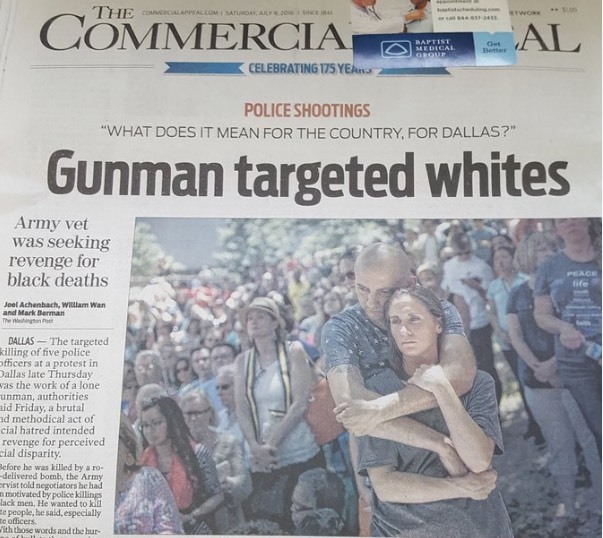 Its journalistic pulse stopped when its editor, Louis Graham, apologized for the paper's three-word front-page headline after the July 7 race-motivated massacre of five Dallas policemen, which read: "Gunman Targeted Whites." CA Editor: We got it wrong. In my view the headline was so lacking in context as to be tone deaf, particularly in a city with a 65 percent African American population. That front page minimized the broader refrain of what's happening in our country with anguish over the deaths of young black men at the hands of police. It has been viewed as suggesting that this newspaper values the lives of white police officers more than young black men who have died in incident after incident. ... The headline required restraint and we didn't provide it. Mr. Graham's blubbering about "oversimplification" is nonsense. Readers will see that "perceived racial disparity," one of many indirect "complex" items affecting the story (written, incidentally, by Washington Post reporters), made it into the very first paragraph. — I wasn't aware that there are supposed to be different journalistic standards for areas that are predominantly African-American. Facts about a particular incident or event don't change because of the racial makeup of a paper's audience, so why would anyone even think of selecting or presenting them differently on that basis? Again, as noted in Item , the topic of "perceived racial disparity" is in the story's first paragraph. Graham insults his audience by essentially saying that it can't handle the news unless his paper first sanitizes it to protect their precious sensibilities. Those who are protesting supposedly on behalf of the black community (more on that later) also are similarly insulting those they claim to represent. — Apparently the words "Gunman Targeted Whites" are supposed to carry different meanings depending on one's racial background. So the newsroom must become more diverse, so everyone can come up with something "better" than those three crystal-clear words. Mr. Graham's insults have now spread to the newsroom, whose members he believe can't communicate effectively unless they are sufficiently diverse. — Well now. Mr. Graham's previously noted insult directed at the newsroom is already merited. If an editor who happens to be an African-American woman can't emotionally handle a three-word, truthful headline without throwing her employer's paper in the trash, what in the world is she doing in journalism? Graham's last four paragraphs (not excerpted) attempted to draw moral equivalence to how it reported on the massacre of 9 African-Americans in Charleston, South Carolina on June 17, 2015. The paper's headline the next day, according to Graham, was "Suspect Caught" (note that he didn't tell readers what the tease above the headline read). But as of the morning of June 18, "alleged" murderer Dylan Roof himself had not revealed his motivations, and only "later confessed that he committed the shooting in hopes of igniting a race war." Roof waived his extradition rights and was flown to Sheriff Al Cannon Detention Center in North Charleston on the evening of June 18. As a subdued Dylann Roof made his first official appearance Friday on charges of killing nine people at a historic black church, police affidavits offered grim details of the murder case, including an allegation that the gunman fired multiple shots into each victim and stood over them to issue "a racially inflammatory statement." Although his motivation was clear from the get-go, this appears to have been the first genuine confirmation from Roof himself that his murder spree was racially motivated. Additionally, unlike the situation with Micah Johnson, who was killed by police shortly after his murder spree, the constraints requiring that all accused perpetrators still alive be described as "alleged" were still present with Roof. Once again, there was no need for Graham to be apologetic. Now let's look at the allegedly powerful group which drove Graham's groveling. It turned out that the "protest" against his paper the next day drew a massive crowd of ... "About 50." The photo at the link would appear to make that figure exaggerated. The Commercial Appeal has admitted that it will let tiny pressure groups drive the content and presentation of its coverage. This isn't journalism. It's a sick joke on the people of metro Memphis, most of whom apparently stopped taking the paper seriously long ago. In an area with 1.34 million people, the paper's circulation is a pathetic 94,775 Daily, and 133,788 on Sunday. Its Alexa web traffic only marginally higher than the Toledo Blade (metro population: 651,000). One can only assume that Gannett, the Commercial Appeal's parent company, is fine with Graham's apology. It would not be unreasonable to believe that any of its papers can be similarly intimidated, and that their coverage therfore does not deserve the presumption of trust. Finally, let's look at a potential strong motivation of the Black Lives Matter-driven crowd which has brought the Commercial Appeal to heal. Memphis has a serious crime problem. The city was the third-most dangerous is in the U.S. in 2015, up from #4 in 2014. While black-on-black crime is a far bigger problem, the area has also seen several especially ugly incidents in the past couple of years involving two or more black males or black mobs attacking whites for apparent sport. Two Memphis police officers have been killed by black suspects (here and here) in the past year. Given this litany, it is in the interest of the Memphis branch of the violent, myth-driven, George Soros-funded and red group-manipulated Black Lives Matter movement and it sympathizers to minimize the exposure of these ugly truths and disturbing trends. Commercial Appeal editor Louis Graham has clearly signaled that he's all too willing to play along.